On this site January 9, 1847, the first newspaper in San Francisco, The California Star - later known as The Alta Californian, was published by Samuel Brannan with Elbert P. Jones as editor. The building which housed the California Star and Daily Alta Californian was either destroyed or demolished prior to 1901. 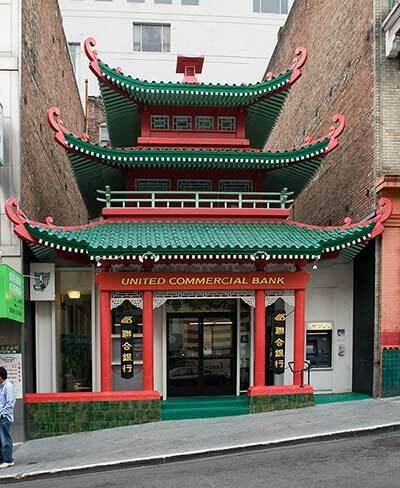 Today's pagoda at 743 Washington Street was built in 1909 as the second Chinese Telephone Exchange building to operate at this address. The walls are hung with banners in red and yellow and gold. Along one side of the room is a row of teakwood chairs with cushions of silk, while near the switchboard are the small black stools which are to be seen all over the Chinese quarter. The switchboard itself is exactly like those in the other exchanges of the city, except that the operatives are men and Chinese. They used the same cry of "hello" in answer to a call - a pleasant tone, cheerful and good-humored. The work of the exchange would drive an American operator insane. For, in addition to the 255 numbers on the exchange, there are at least 125 telephones which are either in Chinese lodging-houses or in clubs. The operatives have nearly 1500 names to remember, together with their owner's place of residence. For example, Woo Kee rings his telephone and says he wants to talk to Chung Hi Kin. He gives no number, for Chung lives in some big tenement and has no telephone number. It is the duty of the operative [the telephone operator] to remember all these names, and it is claimed he does so without effort. "We are going to put in at least 150 new phones during the coming year, so you see we are prospering greatly. We have many visitors here every day, and we are glad to see them, as they do not interfere with business in any way...."
"They come too high," remarks the facetious general manager, "but in the next century we'll be able to afford them, for girls will be cheaper then." 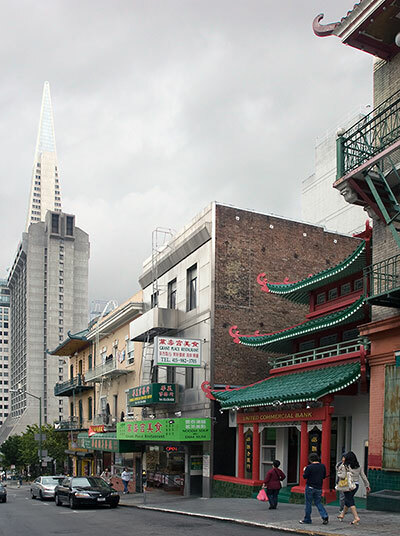 The first Chinese Telephone Exchange of 1901 was destroyed by the 1906 Earthquake and Fire. The new Chinese Telephone Exchange was opened in 1909 and served as an exchange until 1949 when automated dialing replaced operators and the pagoda was sold to the Bank of Canton. We were unable to locate a commemorative marker for the California Star.